The pumpkin shooting record can still be broken. Last year’s shot was 4,095 feet which shattered the 3,930 foot record from 2012. Grandpa’s Gun, a launcher brought to the event by the Ralph Weeder family of Lindsay, set the new record. 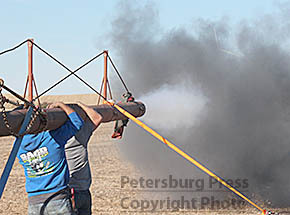 The Petersburg Community Club Punkin’ Chunkin’ committee is planning the 2016 event. But, like in other years, holding the event on Sunday, Oct. 30, 1 p.m., east of Petersburg, is dependent on weather, harvest and field conditions. If it needs to be postponed, it will be held Nov. 6. Punkin’ shooter winners in the local contest are eligible to compete in the World Championship Punkin’ Chunkin’. Machines can shoot, launch, throw or fling a 6-12 lb. pumpkin. Volunteers drive four wheelers through the corn or soybean fields and measure distance shot by a Global Positioning System (GPS). Participants can use an air gun, trebuchet, catapult or slingshot to shoot pumpkins. This will be the fifth year for outhouse races. The teams are made up of five members. Enter the contest at the site. There is free admission, and many kids activities (petting zoo, launching contest, treasure hunt, and obstacle course) and other events will entertain all ages during the afternoon. There will be a costume drawing, food stand, and St. Jude’s donation. Petersburg Community Club members and residents in the community are asked to make individually wrapped bars/cookies for the lunch stand. Please drop them off at the site on Sunday morning. Air cannon firing at Petersburg Punkin’ Chunkin’. event was selected as one of Nebraska’s Top 10 “Can’t Miss” events for fall of 2016 by the Nebraska Tourism Commission.